We worship as usual this weekend: Our convenient community Holy Eucharist service today at 5 p.m. (Saturday, Aug. 8) and tomorrow, the 11th Sunday after Pentecost, at 8 and 10 a.m. We’ll talk about what nourishes our families and communities and the poisons that injure us. At this afternoon’s service, our own Bob and Carol Atkins will stand before the congregation to celebrate the 50th anniversary of their marriage. All are welcome! Please note that there will be no Saturday service for the rest of the month. It will recommence on Sept. 5. After services on Sunday, I’ll be on vacation until Monday, Aug. 31. You can reach Mo. Martha at the church office (949-888-4595, x239) or via her cell phone (203-685-1371). Cindy and Sandy will be available Monday through Friday in the church office (949-888-4595). This weekend in the narthex, please sign up for Aug. 15’s fellowship dinner (Beach Blanket Bingo! 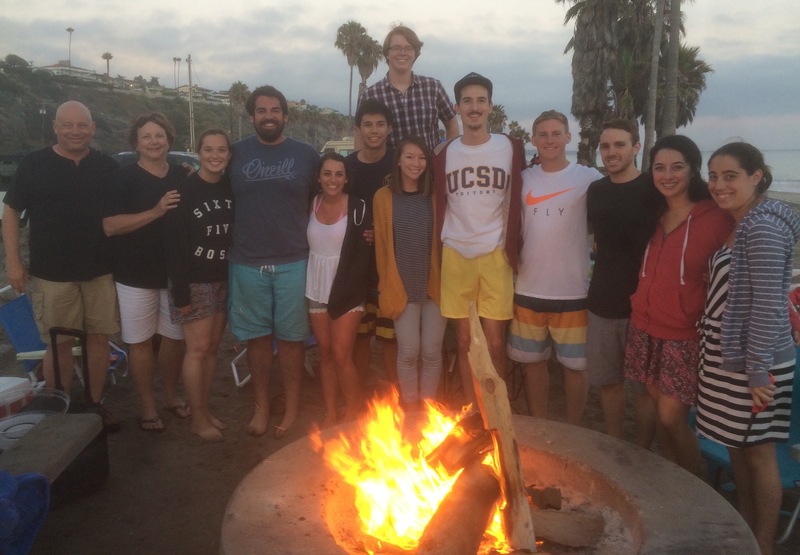 ), the men’s retreat on Oct. 2-4 (going a little deeper in fellowship with one another and our relationship with Christ), and the Corazon build on Oct. 24 (joining with St. George’s in Laguna Hills to build a house for a family in Mexico in one joyous, strenuous day). P.S. : Have you heard about the St. John’s Twentysomethings? The photo shows their annual midsummer bonfire at Doheny State Beach last Sunday. Their next fellowship meeting is Tuesday, Aug. 25 at 6 p.m. at Starbucks. Please join them (or suggest that your favorite Twentysomething come!). P.P.S. : Caregiving Mosaics, the St. John’s caregivers’ ministry, will not meet in August. Our caregivers reconvene on Wednesday, Sept. 16 at 7 p.m. in the Bishop’s Room. In the meantime, please pray for them and those to whom they minister.